Inference for the system reliability $R$ is one of the most popular problems in the areas of engineering, statistics, biostatistics and etc. Therefore, there exist considerable numbers of studies concerning this problem. Traditionally, simple random sampling (SRS) is used for estimating the system reliability. However, in recent years, ranked set sampling (RSS), cost effective and efficient alternative of SRS, is used to estimate the system reliability. In this study, we consider the interval estimation of $R$ when both the stress and the strength are independent Weibull random variables based on RSS. We first obtain the asymptotic confidence interval (ACI) of $R$ by using the maximum likelihood (ML) methodology. The bootstrap confidence interval (BCI) of $R$ is also constructed as an alternative to ACI. An extensive Monte-Carlo simulation study is conducted to compare the performances of ACI and BCI of $R$ for different settings. Finally, a real data set is analyzed to demonstrate the implementation of the proposed methods. Akgul F. G. Robust estimation of system reliability in stress-strength model using ranked set sampling. Ph.D. diss., Ankara University, Ankara, Turkey; 2015. Akgul, F. G., Senoglu, B. and Acitas, S. Interval estimation of the system reliability for Weibull distribution based on ranked set sampling data. 9th IMA International Conference on Modelling in Industrial Maintenance and Reliability, London, UK; 2016, 17. Akgul, F. G. and Senoglu, B. Estimation of $P(X<Y)$ Using Ranked Set Sampling for Weibull Distribution, QTQM 14(3) 296-309, 2017. Akgul, F. G., Acitas, S. and Senoglu, B. Inferences on stress-strength reliability based on ranked set sampling data in case on Lindley distribution, Under Review, 2017. Al-Saleh, M. F. and Al-Hadrami, S. A. Parametric estimation for the location parameter for symmetric distributions using moving extremes ranked set sampling with application to trees data, Environmetrics 14 651-664, 2003. Babayi, S., Khorram, E. and Tondro, F. Inference of $R=P(X<Y)$ for generalized logistic distribution, Statistics 48(4) 862-871, 2014. Bhattacharyya, G. K. The asymptotics of maximum likelihood and related estimators based on type II censored data, J. Amer. Statist. Assoc. 80 398-404, 1985. Chen, Z., Bai, Z. D. and Sinha, B. K. Ranked Set Sampling: Theory and Applications, Springer, New York, NY, USA; 2004. Dong, X., Zhang, L. and Li, F. Estimation of reliability for exponential distributions using ranked set sampling with unequal samples, QTQM 10(3) 319-328, 2013. Ghitany, M. E., Al-Mutairi, D. K. and Aboukhamseen, S. M. Estimation of the reliability of a stress-strength system from power Lindley Distributions, Commun. Statist. Simul. Comp. 44(1) 118-136, 2015. Gokpinar, F. and Ozdemir, Y. A. Generalization of inclusion probabilities in ranked set sampling, Hacettepe Journal of Mathematics and Statistics 39(1) 89-95, 2010. Guttman, I., Johnson, R.A., Bhattacharyya, G. K. and Reiser, B. Confidence limits for stress-strength models with explanatory variables, Technometrics 30 161-168, 1988. Huang, K., Mi, J. and Wang, Z. Inference about reliability parameter with gamma strength and stress, J. Stat. Plan. Inference 142 848-854, 2012. Kotz, S., Lumelskii, Y. and Pensky, M. The Stress-Strength Model and Its Generalizations, World Scientific Press, Singapore; 2003. Kundu, D. and Gupta, R. D. Estimation of $P(Y<X)$ for Weibull distributions, IEEE Transact. Reliab. 55(2) 270-280, 2006. McIntyre, G. A. A method for unbiased selective sampling, using ranked sets,. Australian J. Agricul. Research 3 385-390, 1952. Modarres, R., Terrence, P. H. and Zheng, G. Resampling methods for ranked set samples, Computational Statistics and Data Analysis 51 1039-1050, 2006. Muttlak, H. A., Abu-Dayyeh, W. A., Saleh, M. F. and Al-Sawi, E. Estimating $P(Y<X)$ using ranked set sampling in case of the exponential distribution. Commun Statist Theory Methods 39 1855-1868, 2010. Najarzadegan, H., Babaii, S., Rezaei, S. and Nadarajah, S. Estimation of $P(Y<X)$ for the Lévy distribution, Hacettepe Journal of Mathematics and Statistics 45(3) 957-972, 2016. Salehi, M. and Ahmadi, J. Estimation of stress-strength reliability using record ranked set sampling scheme from the exponential distribution, Filomat 29(5) 1149-1162, 2015. Sengupta, S. and Mukhuti, S. Unbiased estimation of $P(X>Y)$ for exponential populations using order statistics with application in ranked set sampling, Commun. Statist. Theory. Methods. 37 898-916, 2008. Sengupta, S. and Mukhuti, S. Unbiased estimation of $P(X>Y)$ using ranked set sampling data, Statistics 42(3) 223-230, 2008. Soliman, A. A., Abd-Ellah, A.H., Abou-Elheggag, N. A. and Ahmed, E. A. Reliability estimation in stress-strength models: an MCMC approach, Statistics 47(4) 715-728, 2013. Tiku, M. L. Estimating the mean and standard deviation from a censored normal sample, Biometrika 54 155-165, 1967. Tiku, M. L. Estimating the parameters of log-normal distribution from a censored sample, J. Amer. Stat. Assoc. 63 134-140, 1968. Tiku, M. L. and Senoglu, B. Estimation and hypothesis testing in BIB design and robustness, Computational and Statistics and Data Analysis 53 3439-3451, 2009. Wong, A. Interval estimation of $P(X<Y)$ for generalized Pareto distribution, J. Stat. Plan. Inference 142 601-607, 2012. ISNAD Akgul, Fatma Gul , Senoglu, Birdal , Acitas, Sukru . "Interval estimation of the system reliability for Weibull distribution based on ranked set sampling data". 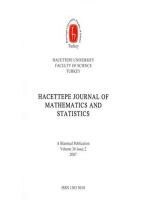 Hacettepe Journal of Mathematics and Statistics 47 / 5 (October 2018): 1404-1416.